Following the results of our research we strongly believe that our campaign is just beginning. Campaign for our government to work with us to create a website for young people designed by young people. This website will be the ‘safe online space’ that young people told us they wanted as found in our research. It will provide factual information, support and help challenge the stigma surrounding mental health. In NI there is currently little to no mental health education in schools. We want to change that by campaigning for a compulsory curriculum programme for all schools to raise awareness of mental health and well being. We want to ensure that this is consistent as one off workshops are not effective. This needs to include training for teachers, support staff and youth workers. There is a huge culture of silence around mental health issues amongst young people in NI. 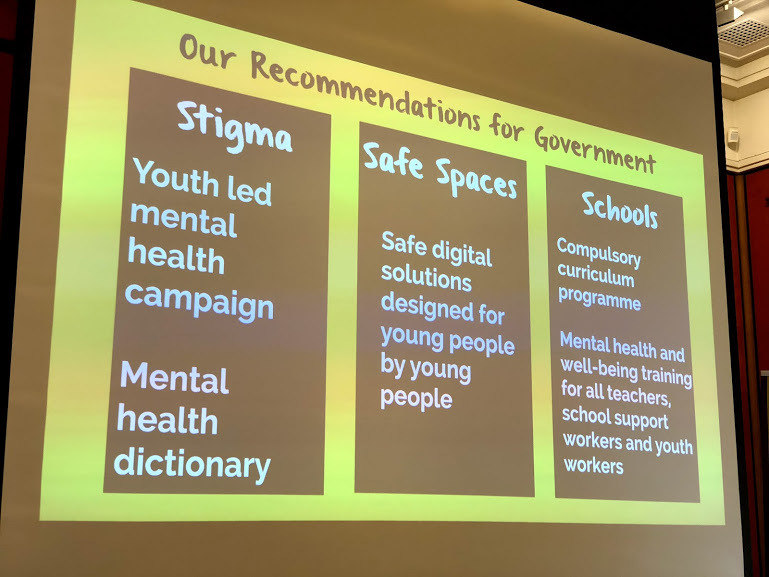 We want to begin to change all that by continuing with our youth led mental health campaign with endorsement from the government. We also want to work with other young people to create a new language around positive mental health by the development of a mental health dictionary.